No two women are the same…what works for one may not always work for the other…BUT with this mind…Female Rejuvenator works for most women…covering the widest possible spectrum of beneficial activity with clinically proven ingredients. More importantly…these ingredients have been combined in a synergistic way, at a molecular level they all ‘fit’ together. Female Rejuvenator can be used as a stand-alone product…BUT for even better results…try combining this product with Total Balance Women’s Premium and Omega 3 / DHA Fish Oil. Daily serving is from 3 to 6 capsules. $29.95 for a 30 capsule bottle. The Product vendor offers a money back guarantee and provides a customer service contact number as well as a tool to send email messages to the vendor. This product is quite expensive. Taking the maximum dose of 6 tablets daily would mean that a 30 capsule bottle would last only about 5 days at $29.95 per bottle. The source information did contain a limited number or reviews that were favorable but anyone thinking of buying this product might want to consider the possible cost carefully, perhaps having the product reviewed with a health care professional who has a background in working with products like this one. 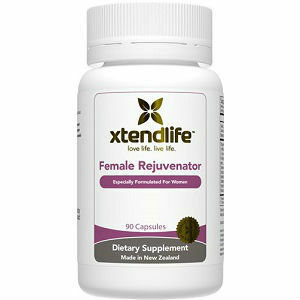 Jackie Horowitz	reviewed Xtendlife Female Rejuvenator	on September 5th	 and gave it a rating of 2.